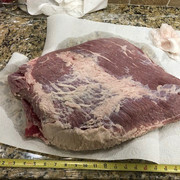 I will do the rince, water-bath, rub, rest prior to a 250 deg smoke on my Yoder (not sure of pellet flavor yet) and take to 190-195 internal temp. - any guesses on how long this will take? - Is it worth resting, chill, fridge overnight and then steam? - When steaming is the meat resting in water or are they separated? 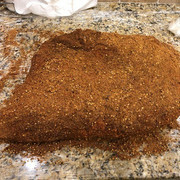 - Should I be prepared to separate the flat & point at some point during the smoke? Depends on if you separate or not, somewhere between 8 -10 hours would be my guess. Depends on when you start, how long a day you want to tend the smoker, or go to bed, etc. Personally I like to go from smoke to steam straight away, so an early start, long day, and wait till it's finished is how I run it. I like to rest the meat on a cooling rack, above the water, it's steaming the meat, not boiling it. Do you like a strip of fat in your pastrami? If you do, then don't separate, if you don't then separate them. Me, I like a bit of fat. The other important part is post cook. Allow the meat to cool fully, then refrigerate overnight. If you are going to slice by machine chill in the freezer for 30 - 45 minutes, and only cut a thin as you can get it to hold together. If you are going to slire with a knife, chill in the freezer for an hour - 90 minutes, as it will take you longer than on the slicer, and you need to keep it coor for longer. I'm probably going to serve it the same day it finishes. You said you like to do the same but steam as well. Are you chilling somewhere in there on a cook that you serve same day? Thanks Jane, just to clarify this is a 22 (pound) corned beef...not 22 pieces. It measures about 21" long and 5" tall at the point. So still 7-10 hours at 225-250 deg? The reason I keep questioning this is a Brisket (which is what it is) of this size would need more than 7-10. Thoughts? 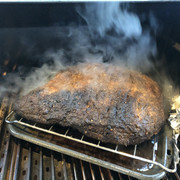 rolltide, from my experience with brined meat, not just brisket, is that it cooks faster than an unbrined(normal) piece of meat.